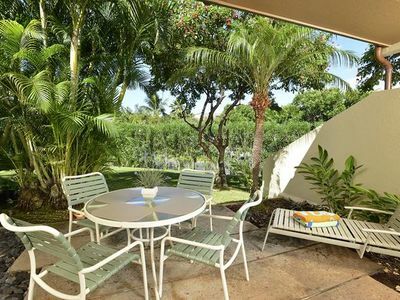 This beautiful family-friendly oceanfront property is in N. Kihei, within steps to the pool and beaches. Lovely gardens with many on-site facilities incl. barbecue, exercise room, and 6 tennis courts. Has ocean and pool view from its private balcony. 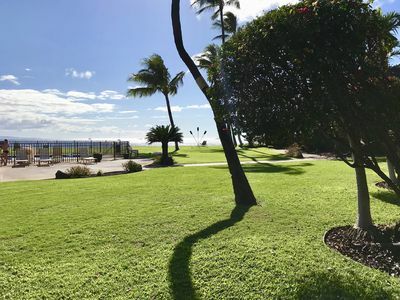 On the beach of Waipuilani Park, this property offers 6 tennis courts, an “L”-shaped outdoor pool, and an on-site gym. 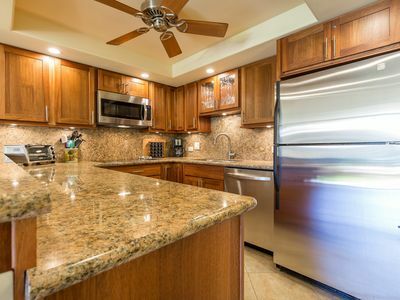 It is only 11.6 miles from Kahului Airport. 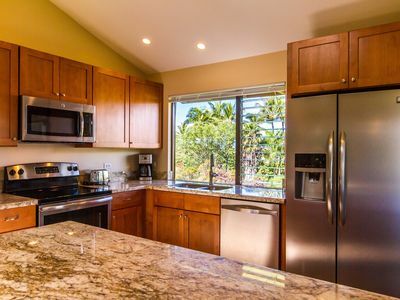 Each tropically themed apartment at Maui Sunset comes with a full kitchen and a balcony. They come with free Wi-Fi, cable TV, and a DVD player. A sofa bed is provided. A hot tub and sauna are part of Maui Sunset. Immaculately kept unit, grounds and gardens. Ten miles from Kahului Airport (OGG). The palm-dotted white sand beach fronting the property is popular with windsurfers during the summer and offers exquisite sunsets. 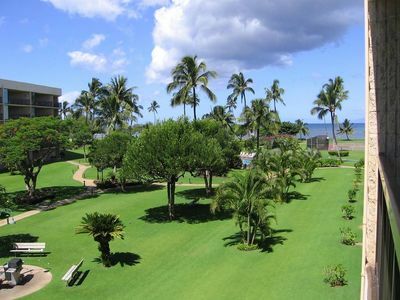 Located along a continuous white sand beach, Maui Sunset is just steps from the ocean. A central common area includes gas barbecue grills picnic tables, a pool with sundeck, a hot tub, and a children’s pool. Parking is free..
Unit #406: Truly the Best! 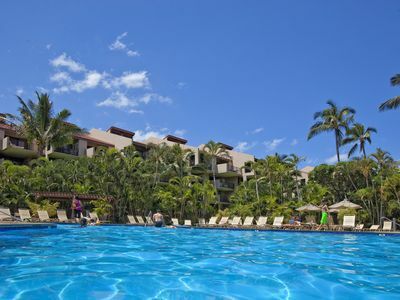 The central air conditioning will allow you to enjoy your tropical paradise in comfort. Or sit on your own private lanai enjoying the fabulous ocean view and the swells breaking over the reef where the green sea turtles play..
A really great value for the location, quality and price – in fact this unit is our 2014 top pick for a 1BR beachfront in Kihei – you simply won’t find a better value on the beach. The owners are on top of maintaining the condo, and it really has a feel of home-away-from home. 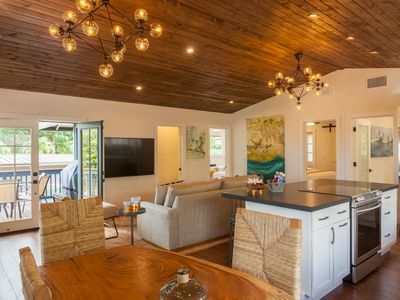 One reason the price stays in line is that the location isn’t sitting inside one of the posh resort areas in Wailea – but folks who’ve been to Maui know that actually matters very little because Maui is very small. 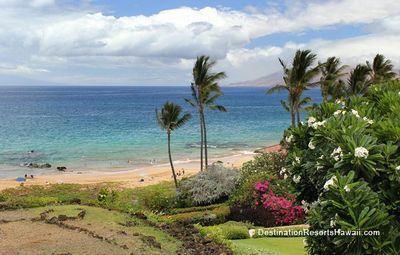 You can be at any part of South Maui from here within minutes. 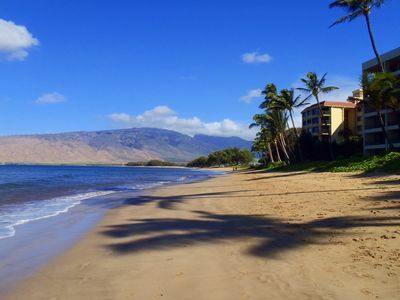 All beaches in Maui are public, so in ten minutes you can be sitting at the same beach Paris Hilton lounges on (that would be Wailea Beach, by the way) but without the “on Wailea Beach” price tag. 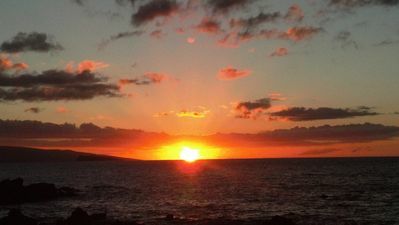 Maui Sunset is located within minutes of some of the top world class beaches in Maui. 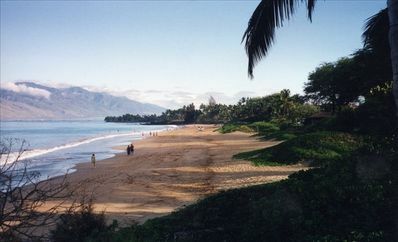 Kanaole Beach 1, 2, and 3 nearby to the South of Kihei are popular for snorkeling and sunbathing. You will want to go to nearby Sugar Beach which is known for its fine white sand. 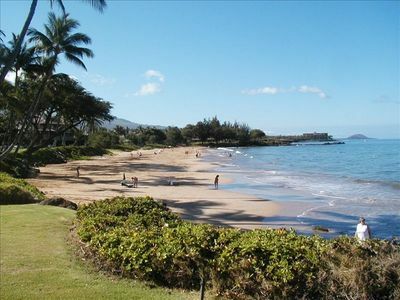 Ulua and Mokapu Beach Park are wonderful places to start your snorkeling experience, all located nearby. 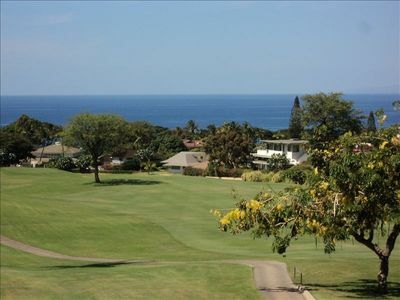 Maui Sunset is minutes away from grocery shopping, golfing and many restaurants. Also near the Maui Ocean Center with its Undersea Aquariums, a wonderful place to visit with the family. Just to the North is the Kihei Canoe Club where you can experience canoeing or kayaking. Or go to the Maui Ocean Center, also five minutes to the North. 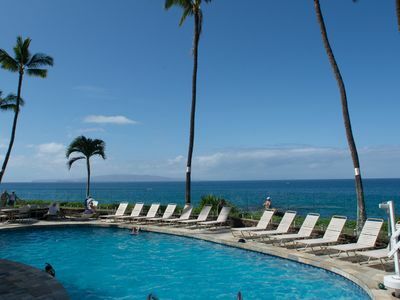 This is the best place to book a snorkeling trip to nearby Molokini and Lanai islands. 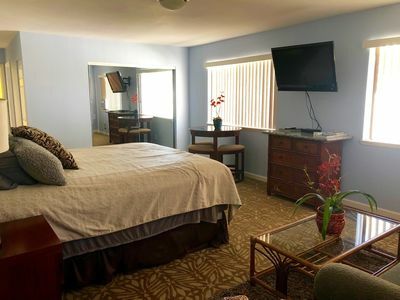 Come stay with us to see what fun you will have at this complex! Island Activities include snorkeling, surfing, hiking, scuba diving, parasailing, submarines, sailing, horseback riding, zip line, helicopters, fishing, windsurfing, kite surfing, golf, swimming, and running! Maui is the ultimate adventure spot! 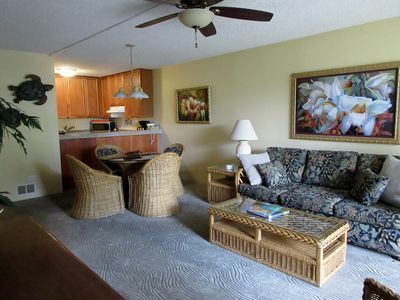 Beautiful 2-bedroom, 2-bath Condo On 5 Acres Of Oceanfront Property - Sleeps 4. Check Me First! Get a Quick Reply!! Newly Remodeled!!! ACROSS FROM ONE OF THE BEST BEACHES IN MAUI. BOOK NOW!! 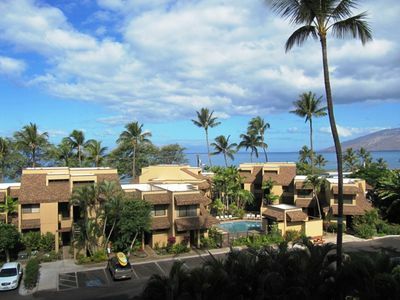 Kamaole Beach Royale 302 ~ Popular 2 BR, 2 BA w/ Ocean Views! 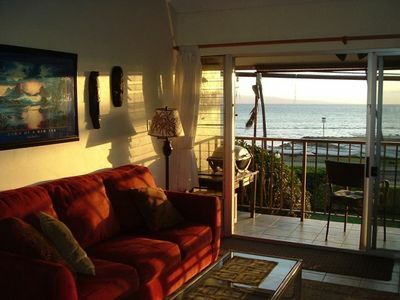 FULL OCEAN VIEW, 2nd Floor 2 BR/1 BA, BEST STAND-UP PADDLEBOARDING ON MAUI! 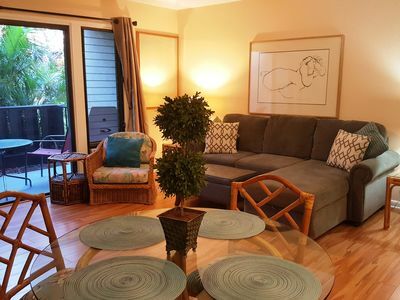 Updated Condo Steps Away from Beach with a/c throughout! 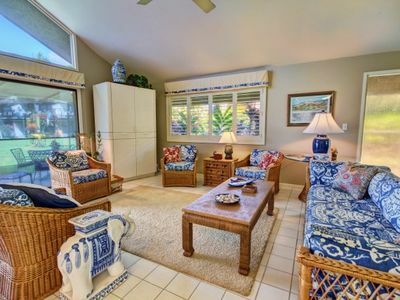 Fabulous Beachfront Property - Ground Floor Corner Unit Steps to the Beach! 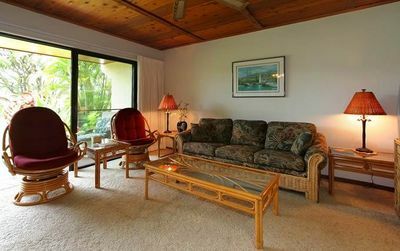 Steps from Kamaole Beach! Spacious 1 bdrm/1 bath conveniently located!! !